The path continues to the rear of the rocks and follows the cliff edge before dropping into a small dip. After 400m a track will be seen running parallel at a slightly lower level. Cross over to the track and go downhill (effectively in opposite direction) to reach farmhouse. After farm house look for clearly marked stile diagonally across field. Cross stile and go downhill through several fields to meet beck. 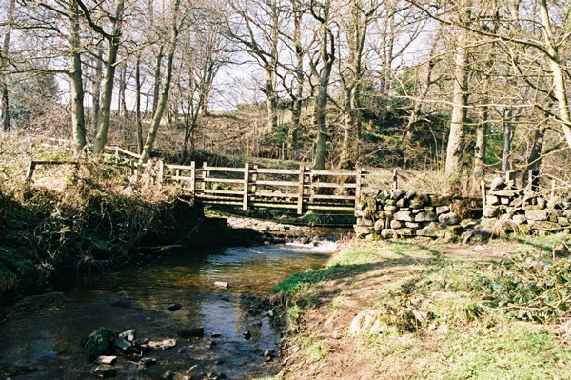 At Mill House ford and footbridge (do not cross) bear left to walk along left hand bank of the stream. This is clearly marked through the woods. After a short while there is a staggered junction but the path effectively goes straight on dropping downhill very slightly. After 1/2 mile the path does an almost U turn and drops quickly to meet stream again. Cross the footbridge and continue down to Smelthouses. Turn left at the road for 400m and then left again along farm track. This veers right after last cottage and then continues uphill in a straight line for 1 mile to meet the road at the top. 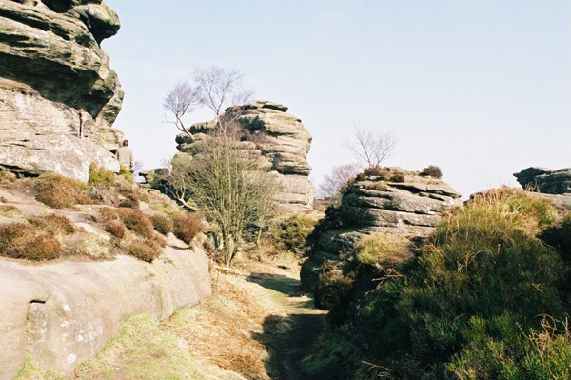 Turn left and then left again to return to Brimham Rocks carpark.